After descending and getting settled into the dive, our dive leaders always check around for cracks, crevasses, and midden piles (a mound of shells and broken up bits of crab) that might indicate the presence Wolf eel (Anarrhichthys ocellatus). 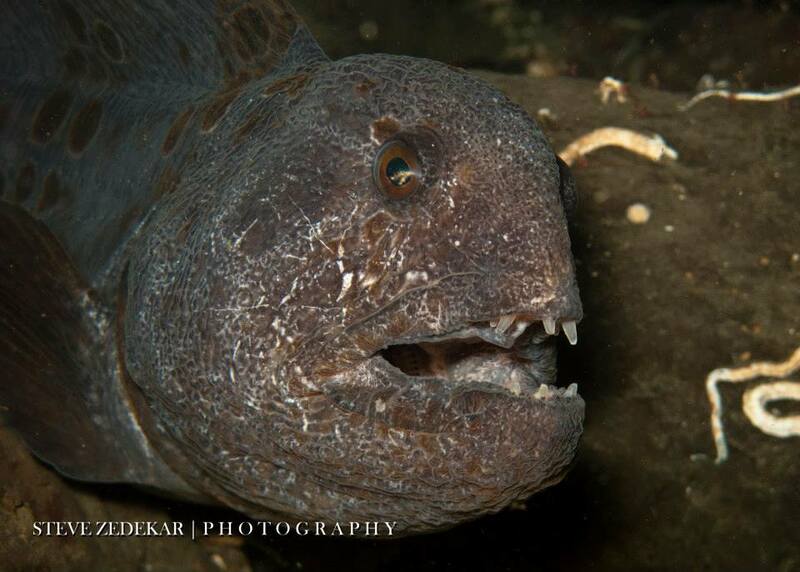 Wolf eels aren’t true eels, but are related to Atlantic wolffish instead. They can grow to 8 feet in length and over 40 pounds. Wolf eels feed on invertebrates such as mussels, clams, and crabs. This is why looking for midden is a good way to locate a nearby den. 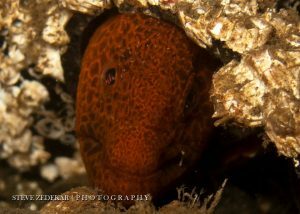 Sometimes Wolf eels and Giant pacific octopus will compete for the best den spaces as they both look for the same den characteristics. Many times divers will notice two Wolf eels in a den together. This is a breeding pair who mate for life and cooperate to protect their eggs from predators such as Rock fish and Sculpin. After about 4 months the eggs hatch and the baby Wolf eels float away on the current, called a pelagic phase, before eventually becoming mature enough to find a mate. Juvenile Wolf eels are a reddish-orange color that changes to dull grey as they mature. To divers Wolf eels look fierce but are generally relaxed and friendly. There have been reports of Wolf eels being preyed upon by Harbor seals, but they have few other natural enemies. Native Americans historically hunted Wolf eels for ceremonial feasts, but they are generally not hunted today. Ready to meet a Wolf eel face to face? Book your tour online or contact Seattle Dive Tours for more information.